CLAT counselling will start from 7th June 2018. The CLAT counselling 2018 is the last step in the admission process. 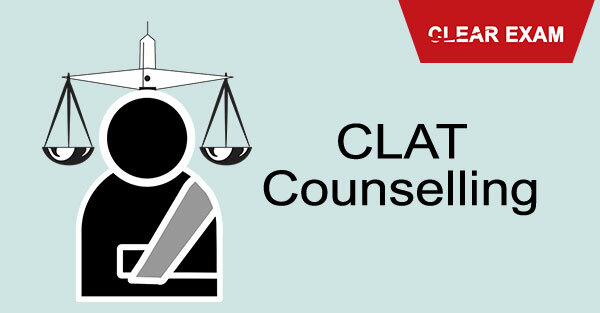 CLAT Counseling process involves a centralized counselling conducted by the 18 NLUs together wherein students are assigned a seat in these colleges on the basis of their merit in the CLAT Exam and their preference of the colleges. This article is all about the CLAT counselling 2018 process. Read the article to know the complete process. The first step in the CLAT counselling process is the announcement of the first merit list. Here all students who cleared the law entrance exam and whose name appears in the merit list are given an option to either lock a seat or shift the seat. All students have to pay a sum of Rs. 50,000 as counseling fee. Then they can either lock a seat or shift a seat. In both cases (locking and shifting of seats) the students have to pay the CLAT counseling fee. This fee is adjusted as against admission fee of the college and students only have to pay the remaining admission fee after deducting this amount of 50,000. Locking a seat means that the student accepts a seat in the NLU in which they are getting a seat and then they will not be called for CLAT counseling again even if they are getting a seat in the NLU placed higher on their priority list by such a seat becoming vacant in future and their admission in the former NLU is deemed complete. Shifting a seat means that the law entrance exam applicant does not want the seat being offered at present and they wish to wait for a better seat becoming vacant in a college higher on their priority list. The default seat choice in the CLAT counselling 2018 is locking a seat. Then the second list of merit is announced wherein waitlisted candidates are called for the CLAT Counseling as against seats which are left vacant after round 1 of counselling. The third merit list for CLAT counselling 2018 is also subsequently announced to fill the seats left vacant by the dropped out candidates. All students who appear for CLAT exam counselling must pay the fee to reserve the seats. One can also withdraw from the admission process within the time limit stipulated by the admission authorities. When a student opts for this then he or she will be returned the CLAT counselling fee after an amount of Rs. 10,000 is deducted from the whole amount. If a student withdraws after the deadline has elapsed then he or she will have the whole amount forfeited and no refund of counselling fee will be paid to them. It is important that all students who are appearing in the counselling process carry with them all necessary documents as the CLAT exam process also includes verification of documents. Certificates which are needed such as caste certificate, certificate of disability, certificate of NRI eligibility, a certificate for NRI sponsored eligibility, and domicile certificate. Last of all if a student fails to appear for the counselling round at the time and venue decided then his candidature for the law entrance exam is cancelled and he/she will not be eligible to get a seat in the colleges under the ambit of CLAT. CLAT Counseling 2018 will start from the first week of June 2018. Check complete Guide for CLAT Counseling Process, Counseling fee and List of documents.